Let me introduce myself, I’m Jane and my partner Cindy and I own The Quilted Crow. When a quilt shop in a neighboring town closed in 2009, Cindy and I took the opportunity of a life time and opened our own quilt shop. Cindy has longed for a place to exercise her artistic talents and I’m excited to use my entrepreneurial abilities to make this business a success. The name of our shop came because of Cindy’s affection for that much maligned bird. She has an extensive collection of crow artwork in her home and admires these birds as “God’s Clean-up Crew.” We decided The Quilted Crow was perfect because as quilters, we also gather scraps and throw-away pieces of fabric and sew them into something beautiful and artistic. Our charming logo was designed by Karen Bilak, artist and owner of Redbud Ridge Quilts. We carry 100% cotton fabrics from our favorite leading manufactures including Red Rooster, Quilting Treasures, RJR, Benartex, Maywood, Timeless Treasures and more. At The Quilted Crow you can purchase your fabric by the yard, fat quarters or fat eighths as well as in kits and block of the month packages. 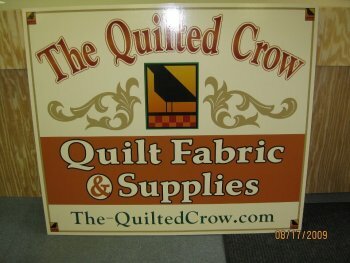 The Quilted Crow also carries a variety of notions and a great selection of books and patterns. Don’t forget to visit our online shop for current sales, promotions and kits, cuts, and block of the month offerings. Also check out our fun class line-up that includes instruction for quilting, specialty techniques, wearables, home decorations, bags and aprons. Stop in today, have a cup of coffee and tell us how your day's been. We’d love to ooh and ah over your latest creation. After all, we’re The Quilted Crow, the place where friendships grow!